Diplomat Plaza Hotel in Lukovit, Bulgaria: Information, Reservations and Bookings. 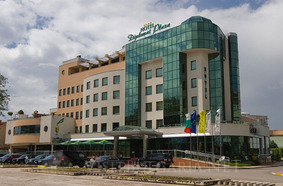 Location: "Diplomat Plaza" Hotel is a luxury four-star hotel for business appointments, company seminars, team-building programs and conferences. It is situated in the centre of Lukovit, just 100 km. from Sofia on the main road E-83 Sofia-Ruse. Accommodation: The total bed capacity of Hotel "Diplomat Plaza" is 96 beds, arranged in: 16 theme rooms with stylish design and unique interior; 30 standard rooms with contemporary furnishing and 2 spacious maisonette respectively with 2 and 3 bedrooms. All rooms are equipped with TV-sets, cable and satellite TV, shower-cabin or a bath, warm and cold mini bar, a safe, electronic locking systems, computer port with Internet connection if the client wishes, opportunity for using fax or copying services. Wine & Dine: The Lobby bar of the hotel has got 40 seats. It is a wonderful place for extravagant cocktails’ lovers as well for quietly having business or private conversations. The restaurant of Diplomat Plaza hotel offers 90 seats. It is arranged in 3 separated sections and offers Bulgarian and European cuisine. PUB Tuborg Bar is for good beer’s connoisseurs. It has got 40 seats and the comfort of the typical Bavaria style. The Sweet bar is known by its elegant and cozy atmosphere. Conference facilities: "Diplomat Plaza" Complex offers a contemporary Conference Centre. It consists of 5 halls with different capacity and modern equipment:(“Lukovit” – 90 seats, “Kotlen ” – 60 seats, “The Dolls” – 50 seats, “The Red Rock” – 40 seats, “Panaka” – 30 seats). The halls are intended for business appointments, company seminars, conferences, cocktails and training. SPA & Relax: The Sports and recreation centre in Diplomat Plaza Hotel offers gym, swimming pool, sauna, solarium, Jacuzzi with Hydro jet, tennis room, aerobic. Professional instructors are at guests' disposal. high qualified massaeurs, beauty specialists and hairdressers.